3.8 out of 5 based on 40 bloggers and 37 commenters. 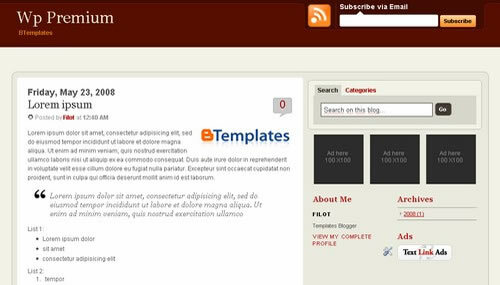 WP Premium is a free blogger template adapted from WordPress with 3 columns and right sidebar. I’ve downloaded this template and it seems fine except for the rss/subscribe button. The button is on the bottom of the subscribe form and it should be on the right of the form (just like on the brown and black versions of WP Premium). Any suggestions for fixing this? The “links to this post” is also in very large font at the bottom of each post. The template itself works fine but the in the page elements, the sidebar is one column instead of two. How can I fix this? I also cannot change the colors. Is this locked on purpose? And the recent comments/posts options do not come up when I press edit. Please help! alguien puede ayudarme a solucionar esto? really great, thanks for sharing! This is my Fav template.I made some blogger hacks over it and now it looks totally unique Template. I’m really very useful to follow a long-time see this as a blog here.Thank you for your valuable information. I made some blogger hacks over it and now it looks totally unique Template. Cómo lo elimino, refiriéndome a que parte del código hay que eliminar o solucionar. I’ve downloaded this template and it works great except for the RSS/Subscribe Via Email. Can someone tell me how to activate the RSS/Scribe function or the HTML Code to Remark Out and let me add RSS Feed along right side. My subscribe by email using Mail-Chimp is working great as is.